the brightest condensation of the Lagoon Nebula M8. This feature sits in the brightest condensation of the Lagoon nebula, e.g. in the picture below, or our image on the M8 page. Named the Hourglass Nebula because of its shape, it was first noted by John Herschel, who misleadingly compared it to the nucleus of the Andromeda Galaxy M31. Blue light image of the Hourglass Nebula. 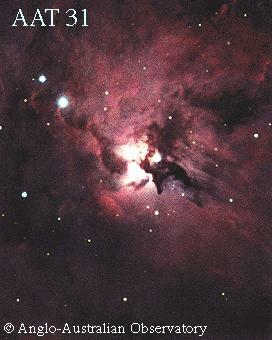 A blue-light CCD image of the innermost part of the Lagoon Nebula, also known as the Hourglass. 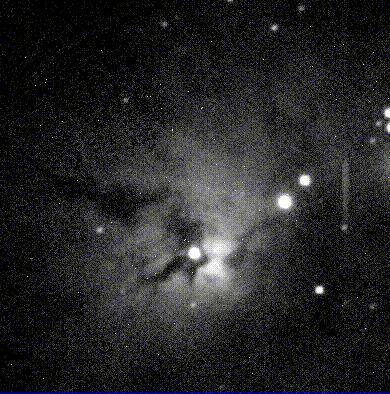 Data by Bill Keel from the Lowell Observatory 1.1-meter telescope. From Bill Keel's Messier Picture Gallery at the University of Alabama.